Papers got to be accepted! Zahra’s paper “Intestinal Organoids Containing PLGA Nanoparticles for the Treatment of Inflammatory Bowel Diseases“, and Martin’s paper “Alternative Foaming Agents for Topical Treatment of Ulcerative Colitis” have been accepted for publication at Journal of Biomedical Materials Research Part A. Congratulations! CBE undergraduate students, Kaylin Kartaly and Siew Yi Lam will join Wang Lab as researcher to work on drug delivery and stem cells projects. Welcome! Dr. Wang will present at DDW 2017 Annual Meeting in Chicago! 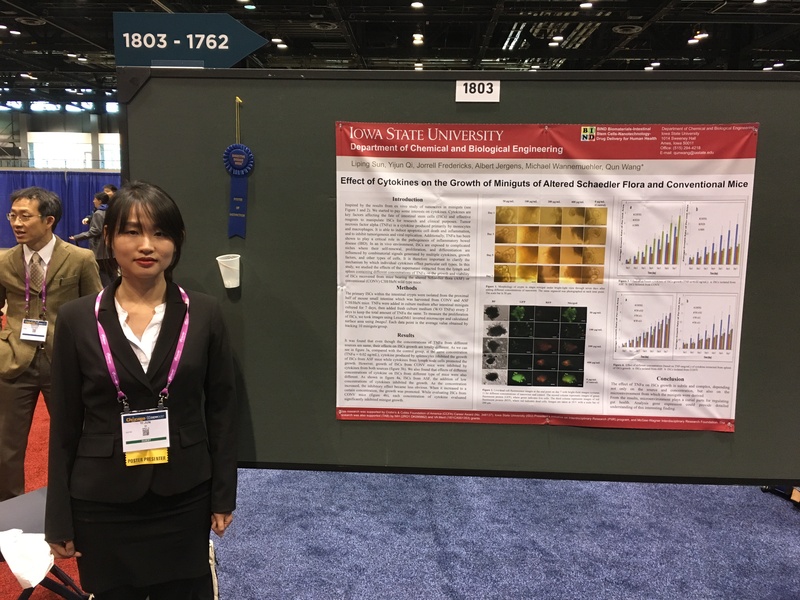 Dr. Wang’s abstract, “Effect of Cytokines on the Growth of Miniguts of Altered Schaedler Flora and Conventional Mice (2672009)“, has been selected as a Poster of Distinction for presentation during Digestive Disease Week® at McCormick Place in Chicago, IL, May 6-9, 2017. This abstract rated in the top 10% of all AGA abstracts selected for poster presentation at DDW. Another abstract, “Growth of Miniguts Isolated from Altered Schaedler Flora Mice and Conventional Mice (2671985)“, has been selected for poster presentation. Congratulations to the entire team! Will see you on May 6, 2017, Noon – 2 p.m. in Chicago! Sherry will give a talk at SFB 2017 Annual Meeting!